Supports the digestive and glandular systems. Is an excellent source of minerals. Helps maintain blood glucose levels already in the normal range. 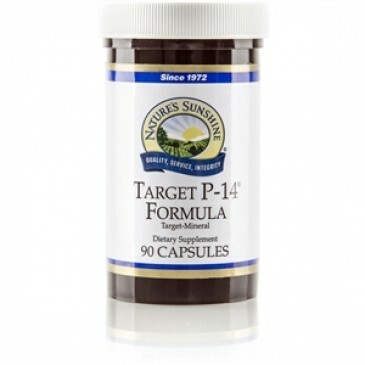 Target P-14 Formula combines nutrients to support proper pancreatic function. Target minerals (chromium and zinc) are chelated to specific amino acids (glutamine, leucine and lysine) and are readily absorbed. Chromium is part of the glucose tolerance factor (GTF), which helps maintain blood glucose levels already within the normal range. It works with the body's natural production of insulin in the pancreas. Zinc is a companion mineral involved in maintaining blood sugar levels already within the normal range. It also supports the function of B vitamins. 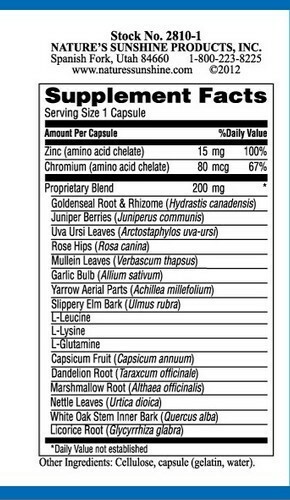 Zinc, chromium, goldenseal root, juniper berries, uva ursi leaves, rose hips, mullein leaves, garlic bulb, yarrow flowers, slippery elm bark, capsicum fruit, dandelion root, marshmallow root, nettle leaves, white oak bark and licorice root.